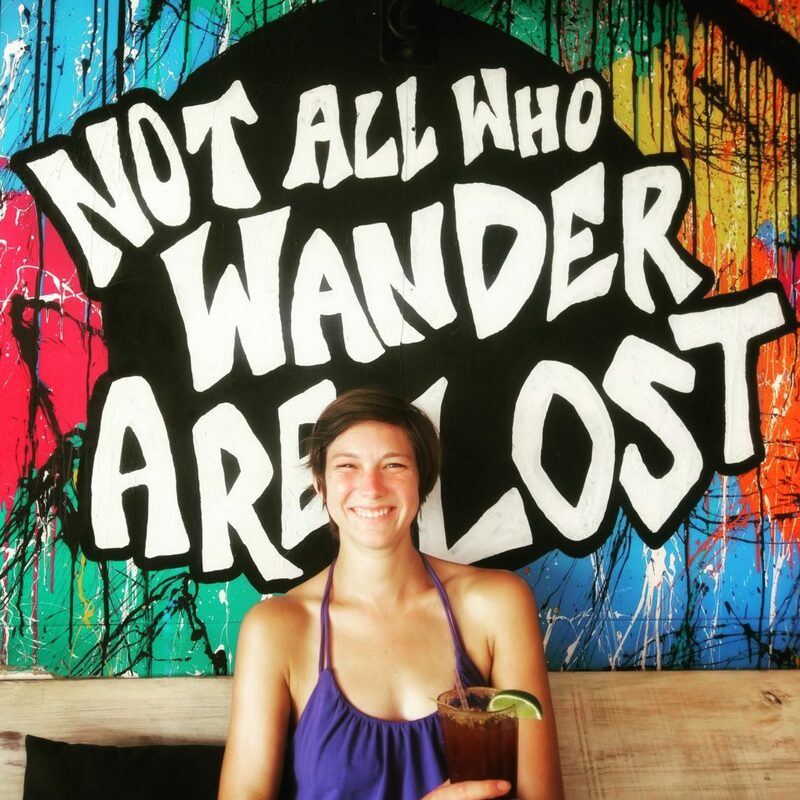 We weren’t actually planning to stop in San Juan del Sur, but we met some backpackers in northern Nicaragua who recommended it. 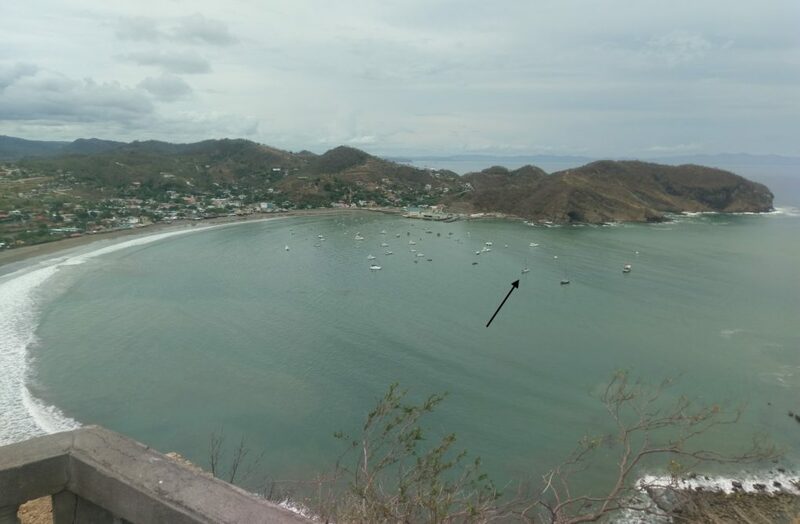 Similar to Bahía del Sol in El Salvador, San Juan del Sur has a couple of cruisers that live there full time and help to usher in and orient newbies. We only got to meet up with Ralph and his wife for one evening (they flew to Texas shortly after we arrived), but they were super welcoming and let us use their hotel as a home base. 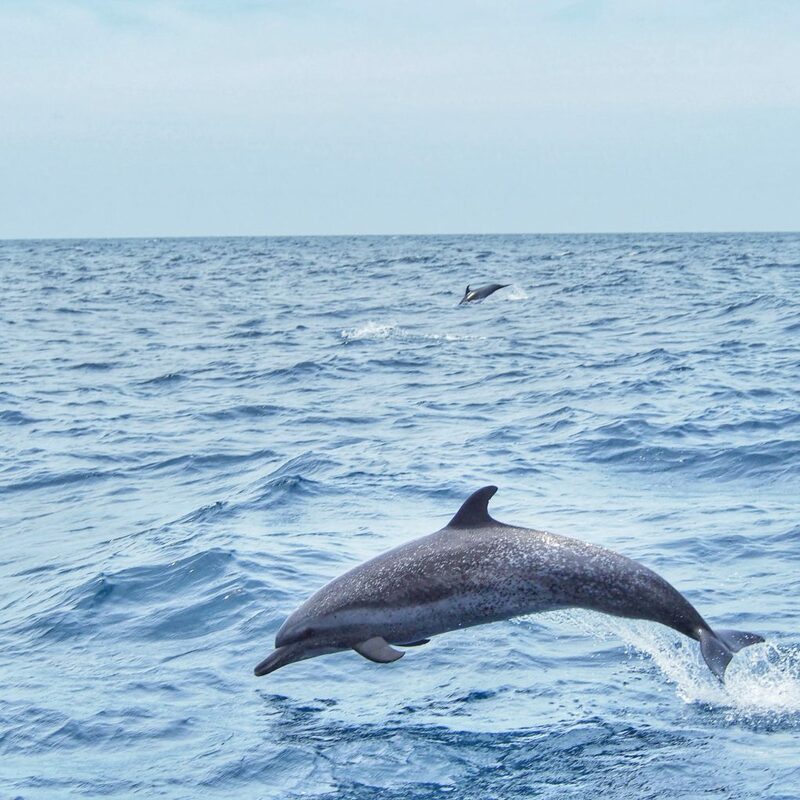 We had an amazing group of Pantropical Spotted Dolphins swim alongside the boat for 30-minutes on our way to SJdS. The biggest downside was the rolly anchorage, which was especially tough for me. I rarely get sick when we’re sailing, but hot, rolly anchorages can be tough on me. I was basically seasick the second I got on board, which meant that we spent a lot of time on shore. The video below shows a quick snapshot of what the skyline (and the beautiful sunset) looked like from deck. This was actually one of the more mellow days, so you can see why it was uncomfortable to be on Untangled. Perhaps the best thing about SJdS was that Yuki was allowed everywhere: restaurants, stores, office buildings, taxis, etc. In fact, the only place Yuki was turned away was the ExpressMart. The security guard stopped us as we walked inside the door, but as we apologized and turned to walk away, he opened the door wider, reached for Yuki’s leash, and waved us inside with a big smile. Yuki was a bit confused, but the friendly security guard watched him for a few minutes while we bought some cold beverages. One of the biggest differences between San Juan del Sur and other places we have been was the number of expat-owned businesses. From what we’ve heard, Mexico is extremely strict about owning businesses and working in Mexico. That’s not to say that expats can’t do it, but it’s difficult, and as a result it’s rare. Both Asseradores and San Juan del Sur have expat-owned businesses, but in SJdS it feels like nearly all of the shops and restaurants are owned by people from the US, UK, Austria, and Australia. Dale Pues – One of our favorite spots for brunch or lunch. Good burgers, good fries, good drinks. Barrio Café – 100% Nica owned and operated. Keith and I spent countless hours working from this café. Their smoked salmon eggs benedict is delicious. Loose Moose Canadian Pub – For loud music and good company, this place can’t be beat. The owner and her sister are both amazing, and it’s worth it to get a few drinks here. We also celebrated Philippe’s 35th birthday here! Philippe taking 5 consecutive shots with increasing amounts of tobasco sauce to celebrate his 35th birthday. Ali Mama Shawarma – The staff here is SO friendly. The shawarma is delicious. You MUST get the potato side dish. Nica Craft Beer Company – They have IPA, and when you haven’t had an IPA in several months, sometimes that’s enough. Parlour – Chicken wings, which were popular in northern Mexico but not in southern Mexico or El Salvador, make a comeback in Nicaragua. Head to Parlour for mid-day happy hour and the best chicken wings in town. Simon Says Smoothies – I recommend the Jesus. Kiss Me Ice Cream – Super cute space + delicious ice cream. The Art Warehouse – Get ready for super crunchy food. Açai, granola bowls, and quinoa are king here. Food was good, though, and we love the art-for-all mission of the place. We saw a number of fun workshops for kids and disabled community members happening while we hung out there. Those places only scratch the surface, but it’s a good start to eating well in SJdS. Besides eating, we filled our weekend time with a surfing lesson from Alex’s Surf School and a hike to the 6th largest Jesus statue in the world. I did yoga nearly every day at Zen Yoga and it was AMAZING. Philippe and Yuki at the base of the Jesus. You have to look pretty hard to see Yuki’s face poking out between the banisters! A view of the anchorage from the Jesus statue. The arrow is pointing at Untangled. Since we’ve left, the political situation has taken a turn for the worse. It’s heartbreaking to see what the country is going through. Even when we were in town, many businesses were taking a hard hit. All of the cruise ships had been cancelled, and restaurants were definitely feeling the decrease in business. We still hope to be able to stop in SJdS on our way north in a few months, but it may not be possible. With the rolly anchorge, we decided we wanted a night off of the boat. We found an Airbnb in town and booked a single night. It was Philippe’s first night off of Untangled and in a stationary bed in eight months! 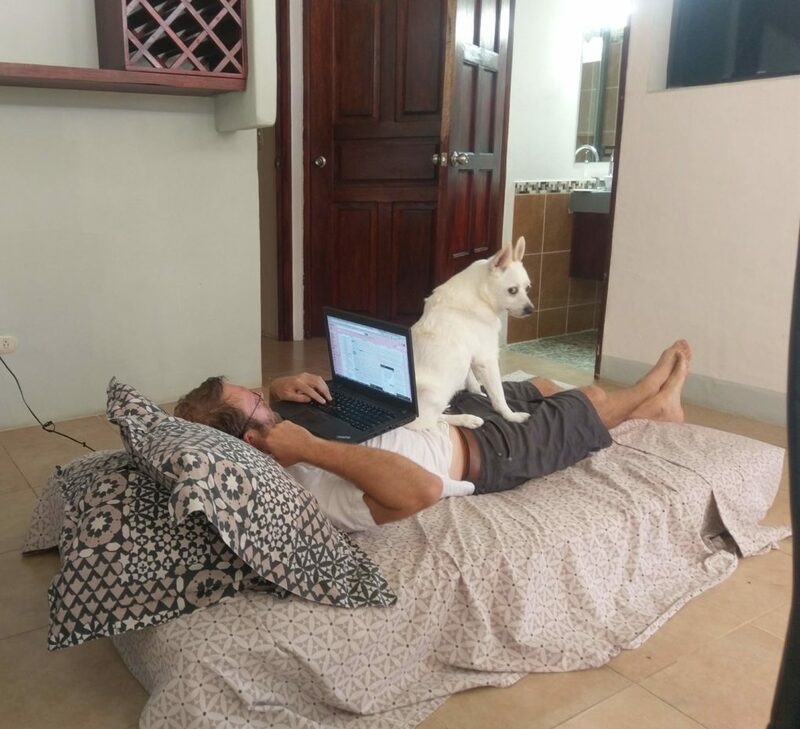 Keith moved one of the mattresses to the living room so he could work and watch TV, and Yuki made himself right at home. We only saw a couple very mellow protests during our time in SJdS. This one was particularly interesting, because on the one side of the street you can see people protesting the government. On the other side, in the pickup truck, you can see people who paid $30/person + drinks to participate in Sunday Funday. Cell phone connectivity – Claro was pretty good. We actually picked up a little hotspot device for $50 that worked really well. Wi-Fi – Good Wi-Fi at many local restaurants, including most of the ones I listed above. To Do – If you’re the young, partying type, Sunday Funday is supposed to be the best party in Central America. We skipped it, and instead opted to do a happy hour crawl through many of the local bars. 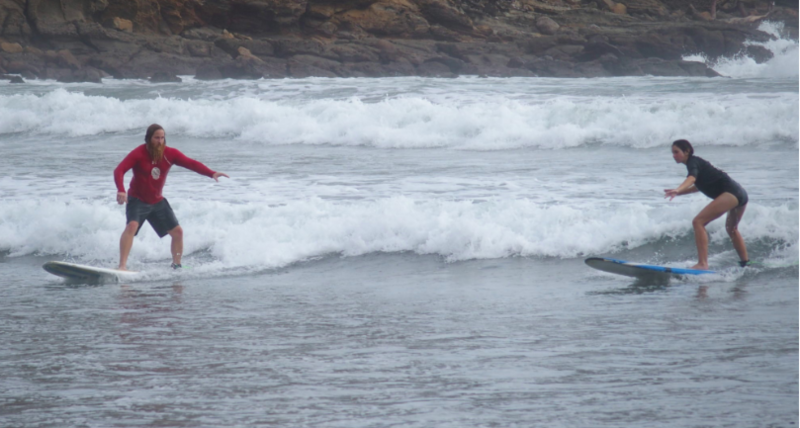 The Jesus hike was worth it, and we’d also recommend Alex’s surfing school for lessons. I think our transportation, board rental, and lesson was like $25 / person for 2 hours of lesson + an extra couple hours of surfing.